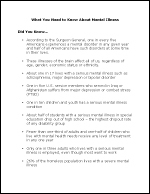 Mental Illness Awareness Week (MIAW) is NAMI’s premiere public education and community outreach activity. 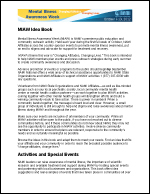 Held each year during the first full week of October, NAMI affiliates across the country sponsor events to promote mental illness awareness, put an end to stigma and advocate for support for treatment and recovery. 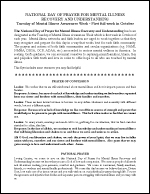 The National Day of Prayer for Mental Illness Recovery and Understanding has been designated as the Tuesday of Mental Illness Awareness Week which is first week in October of each year. 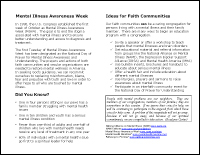 Mental illness networks and faith leaders are urged to work together so that they may recognize and prepare for this day in a way that works best for each faith community. 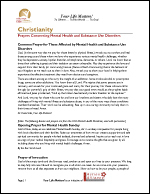 These scripture citations and Sermon Starters are part of the Resource Guide that accompanies the DVD, Mental Health Mission Moments. 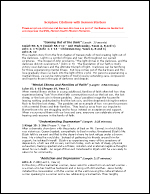 The DVD and Resource Guide are available for $14.95.